On this exciting episode of The Mana Pool we’re bringing back a fan favorite segment, the binder pull! We’re all just opening up our binders and picking out some cool cards to discuss. Then discussing them. You know. After that, it’s back to the emails! We’ve got a whole mess of interesting rules questions and little tidbits here and there. There’s a short rant from Chewie about pottymouths and professionalism that will probably end up offending someone, but it happens. No harm meant I assure you. At this point my show notes say “something at the end”. It’s been long enough since we recorded that I’m not entirely sure what that means. So if you hear something at the end, that’s what it meant. And if you don’t, then I’ve got nothing. 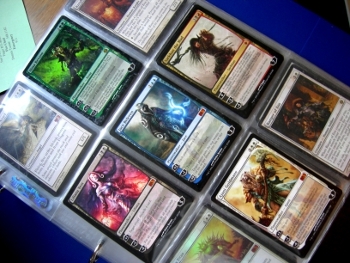 This entry was posted in Podcast and tagged Binder Pull, casual magic, Magic the Gathering, MTG, podcast, The Mana Pool. Bookmark the permalink. Follow any comments here with the RSS feed for this post. Post a comment or leave a trackback: Trackback URL. The binder pool episodes were the fist I ever listened to and got me hooked on your show, and after 2 years of sometimes asking for it it’s back, whoo! yo’ Dirk so green… he’s used as legal tender. yo’ Dirk so green… it’s called “St. Dirk’s Day” in Ireland. yo’ Dirk so green… the Packers were originally called the Dirks. yo’ Dirk so green… and Chelsea’s obviously blue-white, so they gave birth to Trevor, the Renewer. yo’ Dirk so green… Frank L. Baum used Burlington, NC as the basis for the capital of Oz.